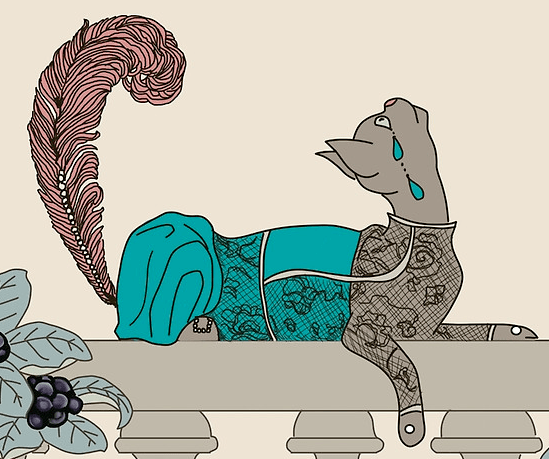 The Art Deco Cats are our most decadent series of art on our store. Each work is available as so many products that it’s almost unbelievable. We favor them as framed art prints, because the frame colors really bring out their eyes. But they make really delightful cards and tote bags. Way back in 1933, Union Terminal opened to the public in Cincinnati, Ohio. This train station was designed in a beautiful art deco style and is one of the most famous examples. We love it a lot. They stopped using after a long time as it fell to disrepair. However, in the 1980’s, a movement was created to save and reopen the station. Mayor at the time Jerry Springer (yes, that one!) had a large hand in saving it and it reopened in 1990 as The Cincinnati Museum Center at Union Terminal. This meant that I also got to see it in person, on a visit to see Amandoll, about 20 years later. That fantastic example of art deco is one of the many inspirations for those little cats. Another, of course, was the fashion of the period. From October 2011 to January 2012, there was an exhibit at the Cincinnati Art Museum titled Art Deco: Fashion and Design in the Jazz Age. While the exhibit included a collection of gowns and a lot of original jewelry and other accessories, what caught Amandoll’s eye was a set of original fashion plates from a French magazine, and especially those done by George Barbier. Once back at home and looking through Barbier’s images again online, an idea formed. Based on each fashion plate, Amandoll painted a canvas of dainty and elegant felines in the same setting, the same color scheme. 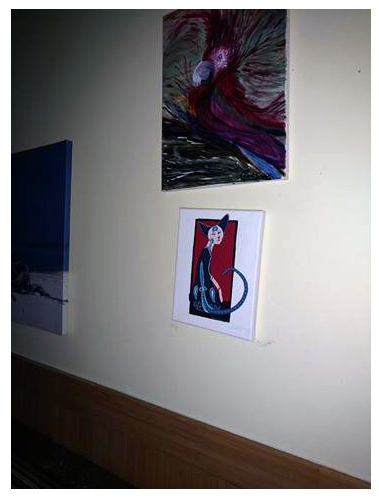 Most were hung in my local café and sold, but one remains. The range of buyers was delightful, from students and professors to policemen. A while later, years perhaps, Amandoll started a practice of a daily drawing, shared on Facebook. Many different drawings and even series were posted, some by request or suggestion. These included cute animals, affirmations, mash-up punimals, mash-up horror creatures, and tributes to deceased pets. One day, The Art Deco Cats returned. Not as canvas paintings, but as illustrated masterpieces, they burst forth from Amandoll’s psyche and also her hand, I guess. Again, each based on a fashion plate, they wowed her friends and fans. She started to dedicate each to a pal with their own feline friend. For cat pairs, she dedicated to couples, or friends with many felines at home. But Amandoll didn’t stop there. She gave each cat a name and a story to match their style and personality. The stories were drawn directly from old silent movie descriptions for each drawing. She interpreted the design, patterns, and colors into a similar scene featuring a very different star. Right now, their short stories are available on the RedBubble descriptions for each design on any product. A little hard to find, but worth it. The more recent Art Deco Cats series are computer illustrated for your pleasure. The series is continuing and currently has over 30 cats. Each cat has her own story. Some cats hang out in pairs, in lovingly detailed situations. They are drawn very large to incorporate the detail. You can find the Art Deco Cat Collection for sale on a variety of products, along with their own stories, here on RedBubble. Some day, when she finally has a moment to sit down and master fiction writing, she intends to actually write a small book of Art Deco Cat Short Stories. It promises to be pretty cute and very entertaining. Come on, Amandoll! Hurry up with those! Also in the works, according to her: coloring books of Art Deco Cats. And maybe even an app game to finally knock neko atsume off of its high horse!